When I was living at home as a teenager, my mother and I went through one of our sporadic health kicks and didn’t eat or drink any chocolate for a few months. Carob powder was the substance we used to replace it, both in drinks and in baking. It was an acquired taste but really rather nice once I got used to it. Whilst the only comparison to cocoa was its form and colour, it had a pleasant flavour which was not at all bitter. When I saw some carob in a health food shop recently, I had a yen to make a carob cake again and remind myself of its qualities. Dom has decided to go on a health kick this month, so for Random Recipes we are tasked with picking a “happy and healthy” recipe. I immediately thought of my new book, Love Bake Nourish by Amber Rose. I shall be posting a review of this at some point, but suffice it to say I fell in love with it the moment I saw it. Although there are only a few chocolate recipes in it, I asked CT to pick any page number in the belief I could always add chocolate if it wasn’t already present in the recipe. 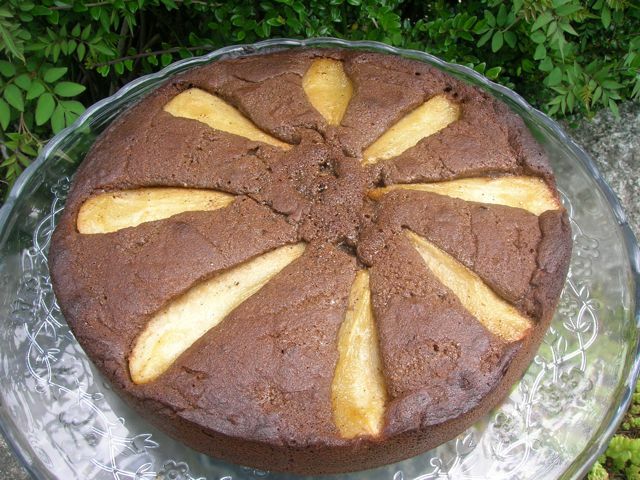 Page number 46 gave me Caramelised Pear and Buckwheat Pudding Cake. This couldn’t have been more fortuitous; I had just been sent a surprise tray of South African apples and pears from Beautiful Country, Beautiful Fruit, so was really pleased to have landed on this one and the recipe sounded delicious. However, the more I scrutinised it, the more I thought it just didn’t lend itself to chocolate. As I was about to ask CT to pick another number, I had a brain wave – carob might work. This was a “free from” cake, having neither wheat nor sugar, so why not make a “free from chocolate” cake too? The recipe called for maple syrup, but as I didn’t have any of that, I used a mixture of honey and my homemade dandelion honey instead. Peeled, quartered and cored two firm Williams pears. Melted 25g unsalted butter in a pan with 2 tbsp dandelion honey on a medium to low heat. Added the cardamom powder and stirred to distribute. Added the pears and left for about 5 minutes to brown a little. Turned them over and did the same to the other side. Whipped 150g unsalted butter with 125g New Zealand thyme honey until light and creamy. Sifted in 75g buckwheat flour and 50g carob powder. Folded this in together with 75g ground almonds. Spooned this into a 22 cm cake mould. Placed the pear quarters in a fan shape on top of the cake and scraped the remaining caramel over the tops. Baked at 170C for 40 minutes until the cake was risen and a skewer inserted into the middle came out clean. Left to cool in the tin for 20 minutes, then turned out onto a wire rack to cool completely. I was really pleased with the appearance of this cake, with the batter rising above the pears giving an appealing sunken look to the fruit. The crumb was close textured, but not in the least bit heavy with a melt in the mouth quality. I was right, carob, caramel and pear make for an excellent combination. It was a delight to get reacquainted with carob and I’m wondering why its been so many years since I’ve used it. Random Recipes is a monthly cooking challenge devised by Dashing Dom of Belleau Kitchen, whereby you get to cook a recipe from your cookbooks that has been chosen randomly. I’ve been in from the beginning and this is my favourite blogging challenge (excluding We Should Cocoa of course); I look forward to it with some trepidation each month – you never know what you are going to get. I’m also submitting this to Javelin Warrior’s Made with Love Mondays whereby everything must be made from scratch. This sounds delicious! I tried carob, back in the day, but didn’t really find it an adequate substitute for chocolate, although I don’t think my baking was very adventurous then. The other ingredients here would certainly remedy any flavour deficits. No, I don’t think it’s a great substitute for chocolate, it has very different qualities, but it is nice in it’s own right. Thanks Nazima, it’s a good one, quite aromatic and not too sweet. sounds and looks divine of course… and I love that it’s gluten free too, in fact I must get a copy of that book, really sounds marvellous!… thank you so much for entering this month, so many yummy recipes to help me get back on the road to recovery!… gorgeous chocolate (carob) / pear combo always goes down a treat… and I must make myself some of that dandelion honey too… so much to do! Thanks Dom, it would be an easy one for invalids to digest I think 😉 I shall be reviewing the book soon, so you might be able to find out a bit more then. I can well understand you feeling cheated JW and this well and truly explains your aversion to carob. Carob is an ok substitute for chocolate. It is an acquired taste though. I have never used it in baking.